Collage with modified images. Ennio Morricone photo: Gonzalo Tello. Chess photo: David Lapetina (CC BY-SA 3.0 (https://creativecommons.org/licenses/by-sa/3.0)). Ennio Morricone is responsible for some of the most recognizable soundtracks in cinema. He’s been the go-to composer for Sergio Leone, Pier Paolo Pasolini, Brian De Palma, and many others. He’s especially renowned for his spaghetti western themes, which helped establish the mood of the genre. In 2007, Morricone received an Academy Honorary Award, and in 2016, he won an Academy Award for Best Original Score, for The Hateful Eight. Here, he discusses one of his other great passions: chess. How about playing a round? Rather than playing a game, you’ll have to teach me how to play the game. I usually open with the queen, so I’ll probably start with her, although once the great chess player Stefano Tatai advised me to open on E4, which reminds me a lot of the figured bass. Have we already started talking about music? In a certain sense … In time, I’ve discovered that strong links exist between chess and the musical notation system, set up as it is in durations and pitches. In chess, the two dimensions remain spatial, and time is what players have at their disposal in order to make the right move. In addition there are horizontal and vertical combinations, different graphic patterns, just like musical notes in harmony. Even still, one can pair patterns and plays as if they were instrumental parts in an orchestra. The player who doesn’t start—who has been assigned black chess pieces—has ten moves to choose from, before it is again the opponent’s turn—white chess pieces. The number of possible moves then grows exponentially with the following plays. This makes me think about counterpoint. There are analogies between the two disciplines—if one is interested in looking for them—and progress in one field oftentimes is linked to progress in the other. It is not by chance that mathematicians and musicians are generally among the best chess players. Take Mark Taimanov—an exceptional pianist and chess player—Jean-Philippe Rameau, Sergei Prokofiev, John Cage, my friends Aldo Clementi and Egisto Macchi. Chess is related to mathematics and mathematics is related to music, as Pythagoras claimed. And this is all the more true for the kind of music Clementi composed, a music substantively based on tone rows, numbers, and combinations … the same key elements as in chess. Ultimately, music, chess, and mathematics are all creative activities. They rely on graphical and logical procedures that also involve probability and the unexpected. What is it about chess that makes you so passionate? Sometimes it is its lack of predictability. A move exceeding the routine is indeed more difficult to foresee. Mikhail Tal, one of the greatest chess players in history, won many games thanks to moves that baffled his opponents and left them with no time to reflect. Bobby Fischer—a real ace, perhaps my favorite—invented sudden and surprising moves. They took risks playing by instinct. I instead pursue the logic of calculation. Well, I would say that chess is the best game precisely because it’s not a mere game. Everything is put at stake—the rules of morality, of life, the wariness and the determination to fight without bloodshed, the resolution to win and do so correctly—with talent, rather than sheer luck. In fact, when you hold these tiny wooden statuettes in your hands, they become powerful as they absorb the energy you are willing to transfer to them. In chess, there is life and there are struggles, too. It’s the most violent sport one could think of, it can be compared to boxing, although it is much more chivalrous and sophisticated. I must confess that, when I was composing the music for Tarantino’s latest movie, The Hateful Eight, as I went through the script, I recognized the tension that silently grows among the characters, and I thought of that like the feelings one develops over the course of a chess game. Unlike what happens in Tarantino’s films, neither bloodshed nor physical harm is part of this sport. Still, there is nothing aloof about chess. Quite the opposite, this game is dominated by a spasmodic and silent tension. Some even say that chess is silent music, and playing is a bit like composing for me. Actually, to say it all, I even composed the “Inno degli scacchisti” [Chess Players’ Anthem] for the Chess Olympiad in Turin in 2006. 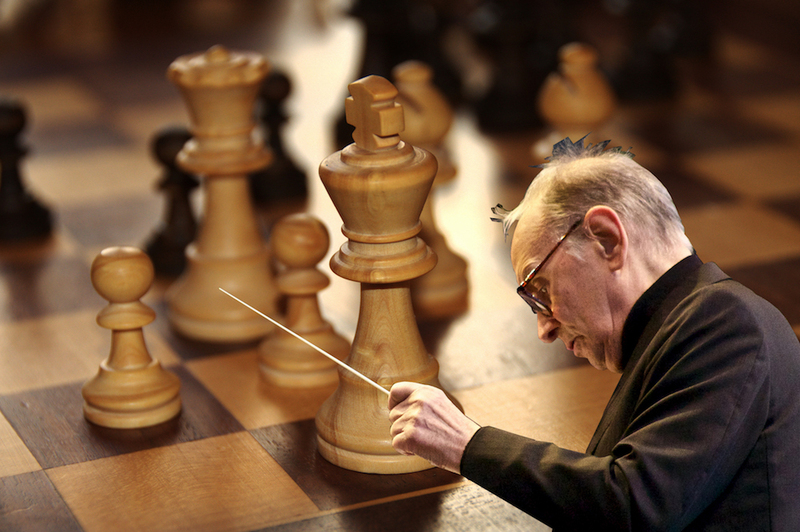 Among your director and composer friends, who have you played chess with most frequently? I happened to play a few games with Terence Malick, although I must admit that I was much better than him. Games were more challenging against Egisto Macchi, while Aldo Clementi was a straight-out difficult opponent. I guess he won something like six out of ten games. He was definitely better than I was, and I can still remember when he told me about that game against John Cage! I wasn’t there, but it remains a legendary one in the music world. A contest between logics and chaos. How do you keep up to date on chess? I know several professional players, and I follow their tournaments and games whenever I get the chance. In addition, I have been a subscriber to the major specialized magazines, such as L’Italia scacchistica and Torre & Cavallo—Scacco!, for years. Once I even ended up paying my annual subscription twice! And yet, in spite of my persistence and passion, I play chess less and less now. Lately I’ve been challenging Mephisto, an electronic chessboard. Sounds like a demonic chessboard. Tell me about it. I always lose. I guess I’ve won no more than ten times in total, sometimes we end with a draw—a patta, as we say in jargon—but usually Mephisto wins. It was different in the past. When my children used to live in Rome, I often played with them. For years I did all I could to transmit my love of chess to them, and over time Andrea has become better than me. Is it true that you played against the grandmaster Boris Spassky? That’s true. It was about ten years ago, in Turin. It was probably the peak of my career as a chess player. No, but it ended half-half, another draw. It was a great game, according to some of the people attending. The whole audience of the tournament gathered behind us—only the two of us continued to play. Later, he confessed that he had played without trying too hard. It was evident, otherwise it would never have ended that way, but still, I was very proud of myself. I still keep the transcript of the whole game on the chessboard in my studio. He started with a King’s Gambit, a terrible move and a difficult one for me. Thanks to this he took the lead, but on my fifth move I tried a Bobby Fischer invention—a move by his historical rival—and I stalemated him. At that point, we were both obliged to make the same moves for three goes, which is enough to claim a draw. Later I tried to transcribe the finale, even asking Alvise Zichichi for help, but to no avail—I was too overwhelmed while it was all happening, and I could not recollect the last six or seven moves. Such a pity. Did you have any recurrent strategies? For a while I played blitz, a speed-based mode. Initially, I obtained good results, but then I got worse. I competed against giants such as Kasparov and Karpov, and I lost dreadfully—also against Judit Pólgar, who was pregnant at the time, and Péter Lékó in Budapest. Those were great occasions. Lékó was kind enough to offer me a rematch after I made a beginner’s mistake in my opening move. I lost anyway, but in a decidedly more honorable way. Over time I have ascertained the existence of a kind of intelligence that only manifests itself during chess games and has nothing to do with a person’s ability to reflect on a day-to-day basis. Yes, I have often met players with whom I have nothing in common, but they turn out to be sensational chess players. Spassky, for instance, seemed like a very laid-back, easygoing person, but on the chessboard he was fiercely determined. How did your passion for this game start? It was a mere coincidence. One day when I was a boy, I came across a chess textbook, and after leafing through it for a while, I decided to buy it. I studied this textbook for some time, and then I started to play with Maricchiolo, Pusateri, and Cornacchione, friends of mine who lived in the same building where I used to live with my parents, in Via delle Fratte, in Trastevere. We even organized competitions. I started neglecting my music studies. One day my father noticed it and told me, You must stop it! So I quit. For years, I never played again. Around 1955, I started again, I was twenty-seven or twenty-eight, but it was not easy at that point. I registered for a tournament in Rome on the Lungotevere. Just consider that I had not studied for all that time. I still recall that my opponent, who came from the district of San Giovanni, played a Sicilian Defense. I made some very poor mistakes and badly lost, but one thing became clear to me—I wanted to resume my study of chess. I studied with Tatai, a master, twelve-time Italian champion who unluckily did not win the “grand” title for half a point in a tournament in Venice, many years ago. I went on with Alvise Zichichi and finally with Ianniello, a candidate master who not only taught me but my whole family. In addition, I trained with him for the qualification tournament through which I accessed the second national division. I almost reached 1700 Elo—a good rank, although a world champion, on average, racks up to about 2800. Garry Kasparov, for instance, reached 2851. You didn’t fool around. Once you even claimed that you would exchange your Academy Honorary Award for the chess World Champion title. Nowadays such a claim wouldn’t seem so drastic, as you now have two statuettes and not one. At any rate, those words really struck me. Had I not become a composer, I would have wanted to be a chess player, but a high-level one, someone competing for the world title. On that condition, yes, it would have been worth dropping my career in music and composition. But that was not possible. Just like it was not possible to pursue my childhood dream of becoming a physician. As for medical science, I didn’t even start, whereas with chess, I studied a lot, even though it was too late at that point—I had stopped for too long a period. So it was decided, I had to be a musician. Do you have any regrets in this regard? I am happy to be accomplished in music, though I still wonder, What if I had become a chess player or a physician? Would I have achieved the same results? Sometimes I tell myself yes. I believe I would have given it my all and I would have succeeded, because I apply myself and I love what I do. Perhaps it wouldn’t have been “my” profession, but I certainly would have dedicated myself with great passion, and that would have made up for the indecision of a feasibly foolhardy career choice. When did you realize that you wanted to become a composer? Was it a question of vocation? I must admit, it was not. It was a gradual process. As I said, when I was a kid I had two ambitions, first to become a physician, then later a chess player. In both cases I wanted to excel in my field. But my father, Mario, a professional trumpeter, did not share my views. One day he put a trumpet in my hands and told me, I brought up all my family with this instrument. You’ll do the same with your family. He enrolled me at the conservatory, in the trumpet class, and only after a number of years did I end up in the composition class. I passed the harmony course with honors, and all my teachers advised me to pursue that direction. Therefore, rather than a vocation, I’d call it a matter of adaptation to necessities greater than me. As for the love and passion for my job, those came gradually as I progressed. Alessandro De Rosa undertook his study of music composition following Ennio Morricone’s advice. He studied with Boris Porena in Rome and then graduated from the Royal Conservatoire in The Hague, Netherlands. As a composer and arranger, he collaborated with Jon Anderson of the band Yes. He currently works as a freelance musician and collaborates with the RAI (Radiotelevisione Italiana) and the RSI (Radiotelevisione Svizzera di lingua italiana). From Ennio Morricone: In His Own Words, by Ennio Morricone in conversation with Alessandro de Rosa. Translated from the Italian by Maurizio Corbella. Copyright © 2019 by Oxford University Press and published by Oxford University Press. All rights reserved.